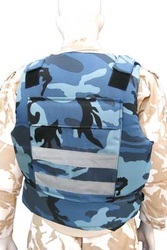 _Our ballistic life jackets are bullet proof up to level NIJ IIIA to the latest NIJ 0101.06 standards using our latest advanced ballistic fibre material. 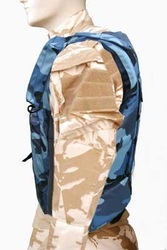 This buoyancy aid has inner pockets front and back for ballistic hard armour plates, so they can easily be upgraded to level NIJ III and NIJ IV. Coming in 4 popular sizes S-XXL, you can download our exact size measurements here. 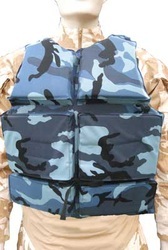 Our life jackets are made for use in a tough environment with rugged nylon/cotton composite covers and fit easily to different body shapes with their simple and secure velcro adjustable straps. With the rapidly increasing incidence of piracy in recent years, bullet proof life jackets are increasingly in demand. Fill our our order form to purchase. We ship WORLDWIDE, so check out shipping costs here.